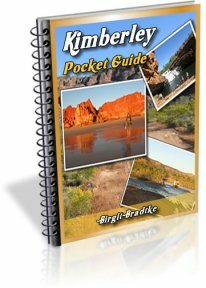 This Kimberley Travel Guide takes you through one of the remotest, wildest and most beautiful regions on earth. For me the Kimberleys in Western Australia were love at first sight and a good enough reason to move here permanently. That's right, this travel guide is written and maintained by a resident of the region, not by some tourism business. That's why it covers a lot more than the usual tourist attractions. My website and guide books give you an inside look at the Kimberly. It's like a trip with a local. ...from Broome to Kununurra on the Great Northern Highway, visiting the Bungle Bungles, Wolfe Creek and Tunnel Creek and many more national parks. ...from Wyndham to Derby along the infamous Gibb River Road, a Kimberley adventure tour right through the heart of the region. Visit Windjana Gorge and Geikie Gorge, and swim at Bell Gorge and Manning Gorge, and many, many other gorgeous Kimberley gorges. Waterfalls? Yes, we have waterfalls! The Mitchell Falls are the most famous but there are dozens more for you to discover. Cable Beach is one of the top five beaches in the world and we have even better ones that the world doesn't know about yet! You may have heard of Cape Leveque, but do you know all the little places between Broome and there? I will take you to waterfalls and beach hideaways, rock pools and fishing spots, all the secret places that we don't usually tell the tourists about! ...about must-haves, must-dos, and must-nots, all you need to know to enjoy this adventure of a lifetime. The natural beauty of this region will take your breath away. It is hard to put into words, which is why you will also find many pictures on this site. Treat yourself to this fantastic video documentary of a drive through the whole region and along the Gibb River Road! Thinking about taking your dog? I've got you covered! Now, this website has several hundred pages and in the beginning it can be a bit overwhelming. That's why I have also created a FREE Kimberley Travel Guidebook to get you started. 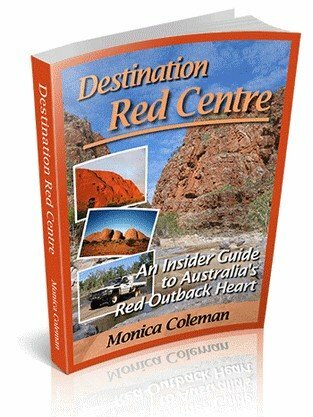 It tells you everything you need to know to plan a trip across the Kimberley. You can get access to it by subscribing to my updates (for free of course) through the box below. And if you like this website and guide, please do help others to find out about it. If you have a blog or website or know someone who does, please consider linking to me. Add a link to your blogroll, bookmark me on your favourite social bookmarking site, post to your Facebook Wall, share it in your groups, tweet it, pin it... you get the idea. Every link helps! ...and I would love to show you why! Welcome to "my backyard" and enjoy your stay! I hope you will love it here as much as I do. Are you travelling from or to Darwin? 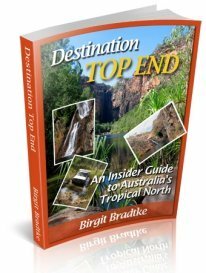 Then you should also have a look at my other Australian travel site, a guide to the rest of the Australian Outback, to find out more about places like Kakadu, Litchfield, Katherine Gorge and more.